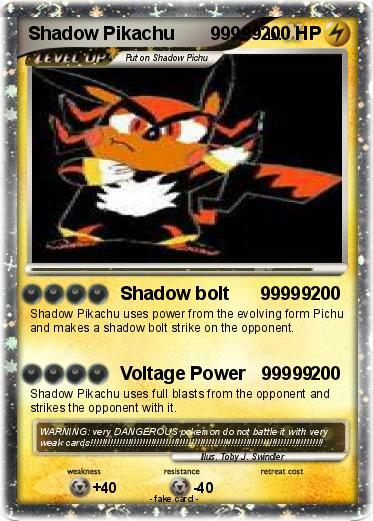 Shadow Pikachu uses power from the evolving form Pichu and makes a shadow bolt strike on the opponent. Shadow Pikachu uses full blasts from the opponent and strikes the opponent with it. Comments : WARNING: very DANGEROUS pokemon do not battle it with very weak cards!!!!!!!!!!!!!!!!!!!!!!!!!!!!!!!!!!!!!!!!!!!!!!!!!!!!!!!!!!!!!!!!!!!!!!!!!!!!!!!! !